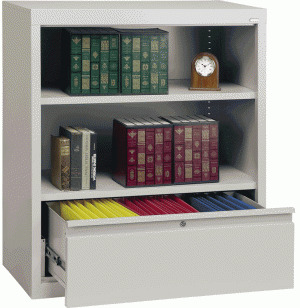 Keep all your materials right where you need them with the Open Bookcase and File Drawer by Sandusky Lee. It combines practical organization with aesthetic appeal that will enhance any classroom or office setting. Adjustable shelves let the Open Bookcase accommodate books and reference materials of all sizes, from oversized children's books to office binders to paperbacks. The lateral file drawer fits letter or legal files so that important paperwork like documents, briefs, student records and artwork are always within easy reach. The full-length pull makes the file drawer easy to open even when full, and the built-in lock secures it from curious eyes and prying fingers. A wide selection of beautiful colors makes this Open Bookcase and File Drawer easy to match with any existing color scheme, while the extra-durable powder-coat finish ensures that it will continue looking like new for a long time to come. Organization, convenience and a great-looking furniture piece, all in one. Convenient Storage: The combination open bookcase and file drawer lets you keep books and related files in close proximity. 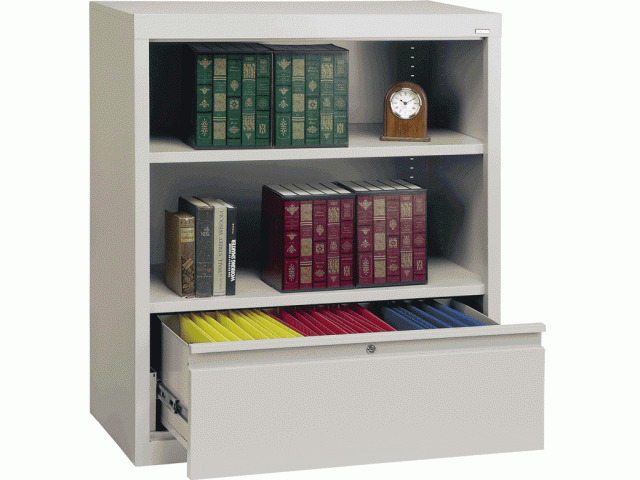 Adjustable Shelves: Shelves adjust in 1" increments to accommodate books of all sizes. Spacious Filing: The spacious lateral file drawer can hold letter- or legal-sized files, for everything from children's artwork to legal briefs and invoices. Security Lock: Built-in lock provides added security for important documents and prevents curious prying. No Handles: Full length drawer-pull ensures durability - no drawer handles to break off. Beautiful Colors: Wide range of color choices allow this bookcase to complement any office or educational décor. Durable Finish: High-quality, powder-coat finish keeps this file storage bookcase unit looking new.